Laryngeal Mirrors for Dysphagia Therapy. Use Laryngeal Mirrors to provide thermal-tactile stimulation during swallowing therapy for dysphagia. Highest quality, stainless steel instrument with removable octagonal threaded handle. Laryngeal Mirrors can be sterilized by boiling. 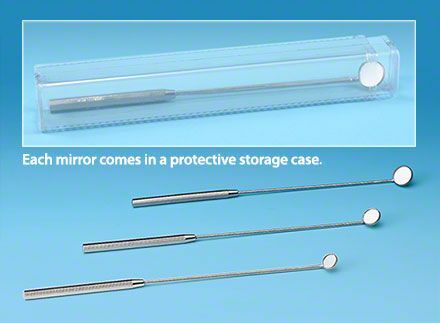 Handy protective storage case keeps mirrors safe. Please specify size when ordering: 16mm "01", 14mm "0", 12mm "00", 10mm "000". Save when you buy 12 or more, only $29.50 each!